Analysis tools for (1) determining which alphanumeric Adabas fields should be mapped to "VARCHAR" RDBMS columns, (2) analyzing which Adabas descriptors are candidates for an RDBMS primary key or alternate index, and (3) analyzing the physical characteristics of Adabas PE and MU fields to determine the kind of RDBMS structures to which they should be mapped. The "ODBC Import" function makes it even easier for a site to import existing RDBMS schema into tRelationalPC (no need to type in those Tables, Columns, and Constraints manually). 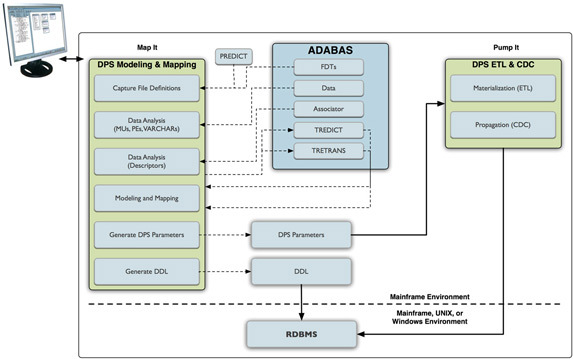 A simple drag-and-drop procedure is then all that is required for the creation of Adabas-to-RDBMS mappings.